Who’s that girl? What’s her name? New lid art – Her lids used to be a kelly green with a grey scallop edge design. Now they’re a light pink with a white line design. Also, the lids were done with acrylic paint instead of pastels and watercolor pencils, and they’re glossy instead of matte. It’s not much, but I think she looks better! Her old makeup was being super washed out with her new dark brown hair. As per usual, there were some snags during the process. Rory’s eye mech snapped on the lower lid area, which I promptly glued back together. It’s holding in there, but probably one day I’ll order a new eye mech. The eye mech also sticks after her brown side-facing chips… and because of my impatience, I also kind of scratched the lid art on her left eye (woops!). These things don’t bother me terribly, because Rory’s lid art had some blemishes on them before, and I don’t change my girls’ eyes a ton. Rory is also looking pretty darn fashionable. I put her in a top I knitted, a Kuloft skirt, MiniJijo socks, and some stock shoes. She really feels like a completely different doll! It’s a little weird, as I’m really not used to seeing her on my shelf the way she looks. She’s definitely way easier to dress with her dark brown hair, as opposed to her bright orangey-pink hair. I wonder how this new look will change my perception of how she should be dressed and photographed. I’ve mentioned in my Rerooting Adventures posts that I really wanted to change Rory’s scalp. I wasn’t happy with the way I had cut the neon orange and pink hair, and the color also read more orange than pink to me. I had bought more saran to try rerooting my second Cool Cat scalp, thinking I would do a better job, and that the second time would be easier than the first time. Well… I sort of fell into a rut with the rerooting. Rerooting was really tough on my hands, and the process as a whole wasn’t very fun. I had “work on reroot” on my To-Do list for ages, and I just wasn’t getting around to it. 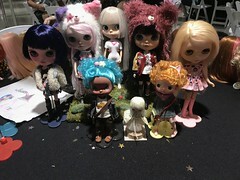 SO, I decided to part with the materials and I got a Didee Eureka scalp for Rory instead! Old hair on the left, new hair on the right! She looks so different! I was considering redoing her face-up and deepening her carving, but honestly, I don’t think I’m ready for such a big project. Also, I’m a little attached to her simple face. 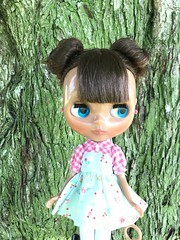 I think of her as kind of the transition between my fully customized girls and my stock girls. I will, however, be redoing her eyelid art. I’m not a fan of the primary green on her lids. Also, they’re a bit scuffed, which bothers me some. All in all, I’m so glad the weekend is finally here! I have a number of projects I’m looking forward to working on ^^. It’s replaced my very old multicolor pen from Muji. 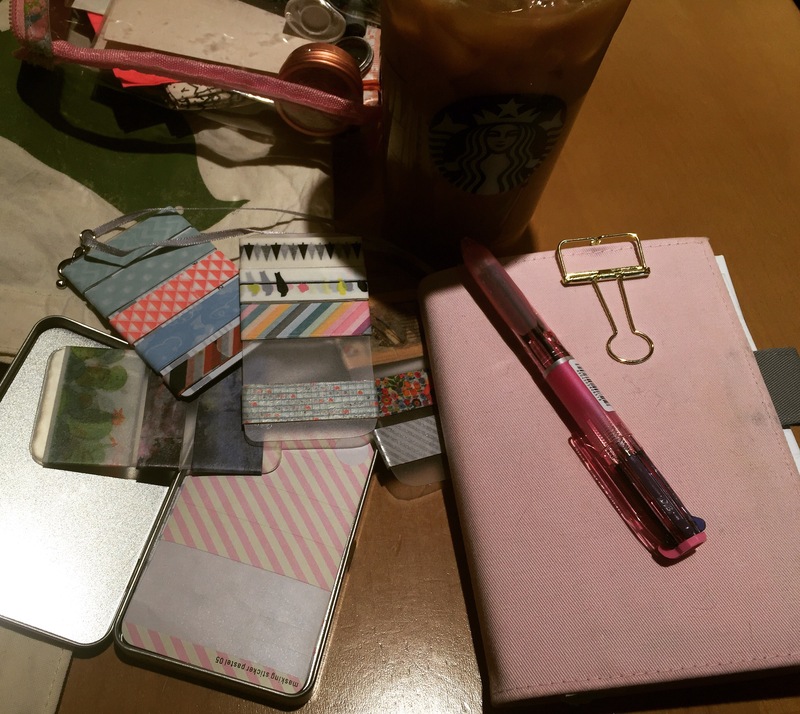 Jann of Project Dollhouse loves the pilot Hi-Tec C, and I knew I had to try it. I liked that I could pick the ink cartridge colors and size, and the pen case. 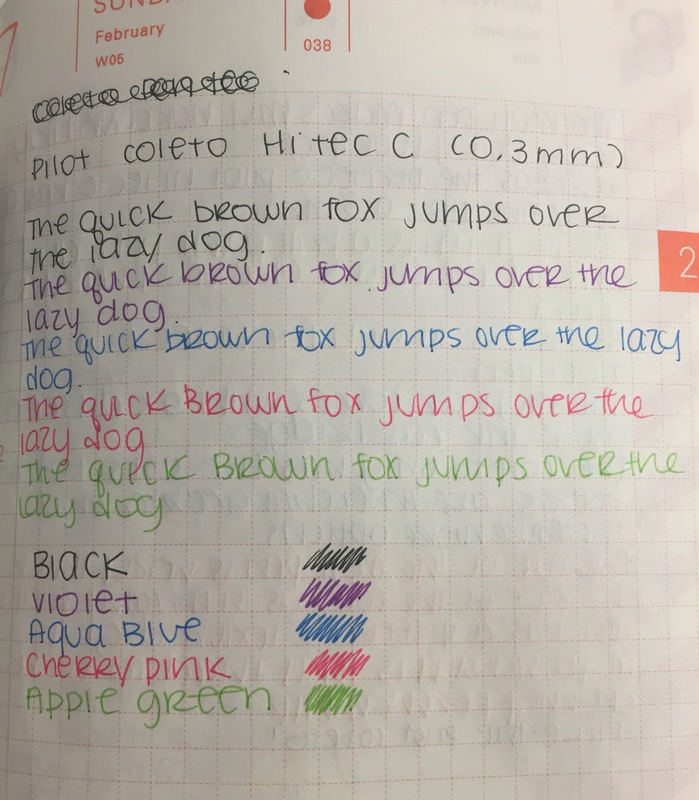 I ordered the pink coleto with Black, Purple, Cherry Pink, Apple Green, and Aqua Blue ink, all in 0.3 mm. I’m a huge fan of the black, purple, and cherry pink. I probably could have done without the green and the blue. 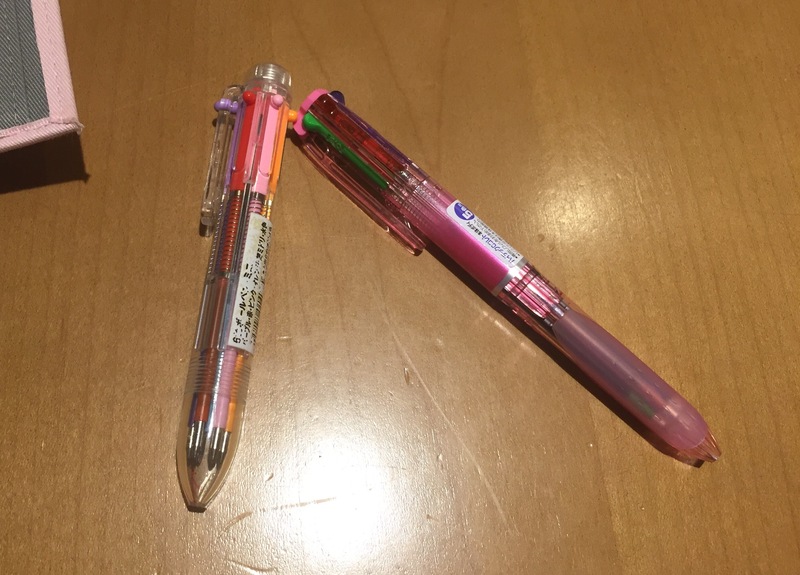 The Cherry Pink shade actually reminds me of a pen I had when I was either in elementary school or junior high school – it’s the same shade of this scented pen I had. Literally, when I look at my writing using the Cherry Pink ink, I can remember the odd artificial cherry/strawberry scented ink of my youth. The accessible areas are huge. Way bigger than any harvest moon game maps. There is a ton of content and areas to unlock. There are a ton of cut scenes, not just limited to with the bachelors or bachelorettes. The characters each have depth and backstories. They have realistic problems, and to befriend them is to learn more about them. You’re limited to two gifts a week per person. (Huge plus). I hate having to make daily rounds to distribute gifts to all the townsfolk. Regardless of your gender, it looks like you can court any of the bachelors or bachelorettes. It almost feels like an open-world game. Because the game is still fairly new, I’ve encountered some glitches. But I believe the game has continued to release updates to fix this. Fishing is the Worst. The absolute Worst. Only two more days till the weekend! 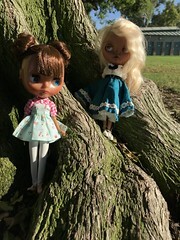 Jointed body (Sweetiiger and Azone) – I haven’t tried the Azone on a Blythe, but I have owned dolls on an Azone body. I like the poseability of the jointed bodies, and the different hands are fun for photos. However, I found that these types of bodies don’t support a Blythe doll’s head very well, and the joints tend to buckle under the weight of it. Licca Chan body – I love the look and proportions of this body. I like the bendy limbs, and its potential for posing. I prefer the non-tilt neck bodies over the tilt-neck ones. The feet are bigger than that of the regular stock bodies, which makes finding shoes that fit inconvenient. Stock Blythe body – I don’t dislike this body – it has a classy feel to it and because it’s the body that stock blythes come in, I associate it with just being quintessentially blythe-like (kind of like shiny stock faces). The stock body doesn’t really have a wide range of poseability, but there’s just so much out there in terms of clothes and shoes. Here’s the tutorial I followed. I first tried it on Rory, who was on a tilt-neck Licca chan body. Her head wobbled a lot because of the tilt-neck piece, and I wasn’t the biggest fan of that as it felt a bit unstable. I put her back on the body I purchased her with (the fake blythe body), and transplanted the Licca chan arms into the sockets. This was relatively easy, as Rory’s stock body arms popped right off with some vigorous pulling. I decided I would do the same for Finley as I wasn’t crazy about her stock body anyway, but I also didn’t want to completely swap her body out for a Licca chan body, being that she is one of my professionally customized girls and I have never had success with opening up her head ever. Finley’s stock arms were a nightmare to take off! My right hand is swollen right now from all the pulling and twisting I had to do to get them off. BUT! I am REALLY happy with how she looks right now! SO CUTE. So happy! I took this chance as an opportunity to try out my newest dress on her, and kind of play with her hair. I ordered a Plastic Fashion dress a couple of weeks ago, and delayed opening it for a day I felt like I needed a pick-me-up. I wasn’t sure who this dress would go to, but it suits Finley because it has a Goldilocks vibe to it. I also tried doing a waterfall braid for the first time. I plan on going to the park this weekend to hopefully see some cherry blossom trees, and I’m definitely taking Finley out for photos!